Experience Rome, Venice and the fashion capital Milan. Starting your 6- day journey in Rome – explore «the Eternal City». Colosseum, Vatican, Roman Forum, the Trevi Fountain, everywhere the eyes are pampered with history and art. 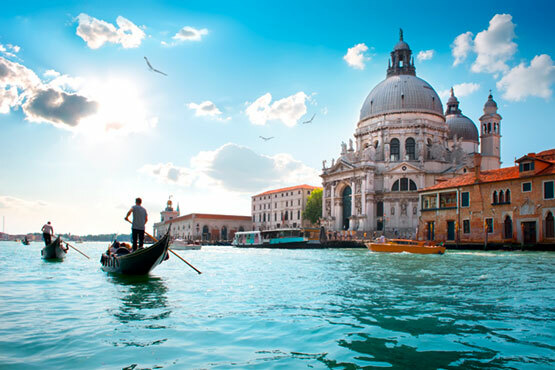 Next stop will be in Venice – the city for lovers with romantic streets, hidden squares and idyllic canals offers to this city a unique atmosphere. Travelling by train to Milan, which is well known for shopping and cultural highlights such as the Cathedral or Leonardo Da Vincis’s world-famous painting The Last Supper. Transfer by Vaporetto from the nearest station of your hotel to the railway station. Depart Venice by train to Milan, which is well known for shopping and cultural highlights such as the Cathedral or Leonardo Da Vinci's world-famous image The Last Supper. Overnight in Milan. 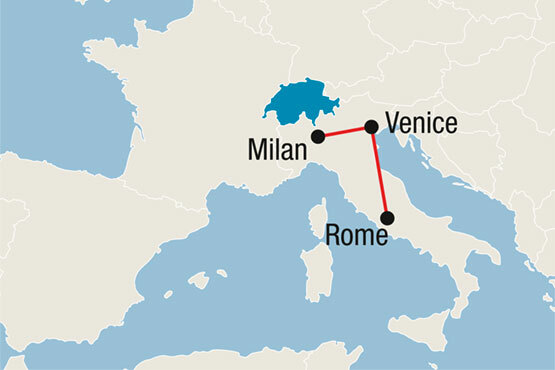 Depart Milan by train to Switzerland and continuation of the journey with any Swiss package. Venice - Transfer train station St. Lucia – hotel or vice versa. Taxi boat 1–6 persones, max. 1 baggage per person. Additional charges between 9 pm – 7 am and narrow canals. Vaporetto tickets for the whole island (incl. train station). The card must always be scanned when boarding the boat. Round trip on the water with the traditional Venetian gondola (5-6 persons). You will have the opportunity to discover the true, romantic Venice with its beautiful bridges and romantic lanes. » When: Several times a day. Duration: approx. 30 min. Boat trip to the lagoon islands of Murano (incl. visit to a glass factory), Burano and Torcello. » When: daily 1.4.-31.10. at 9.30 o'clock and at 14.30 o'clock, from 1.11.19-1.4.20 at 14.00 o'clock (excl. holidays), in D/F/E/I. Duration: approx. 3¾ hrs. The famous mural by Leonardo da Vinci, one of the greatest masterpieces of the history of art, is located in the refectory of the church of Santa Maria delle Grazie. »When: Tuesday to Sunday between 09.00 am and 06.00 pm, audio guide payable locally (about Euro 4.-). Duration: approx. 20 minutes incl. Film. Milan - Transfer from train station to your hotel or vice versa.Private taxi 1-3 persons. Combine your trip with any Package in Switzerland, i.e.